The business and financial press has been abuzz with speculation about when the Federal Reserve would begin raising interest rates. After the meeting of its Federal Open Market Committee (FOMC) on December 15-16, the Fed ended the suspense by announcing that it was raising its target federal funds rate by a quarter of a percentage point (to a range of 0.25 to 0.50%). Flying under the radar, though, was the Fed’s use of a dramatically different method of raising interest rates. The new method involves paying billions of dollars to banks, primarily by paying interest on banks’ reserves held at the Fed. The payments will reduce the amount of money that the Fed remits to the Treasury and, ultimately, to taxpayers. Why Is the Fed Paying the Banks? This new method is best understood when viewed in the context of the recent financial crisis. The collapse of the housing bubble in 2007 threatened both the financial system and the broader economy. The Federal Reserve began a campaign of aggressively reducing interest rates, lowering the interest rate that it controls, the federal funds rate, from its peak of 5.25% in September 2007 to just 2% in April 2008. The federal funds rate is an interest rate that banks pay when borrowing from other banks. Lower costs for the banks in turn lead to lower interest rates for business and consumer borrowing, thus encouraging greater spending, output, and employment. In making these changes to the federal funds rate, the Fed used its classic method of changing the level of bank reserves. (See sidebar.) It is this method that the Fed jettisoned when it announced its new procedures. Banks are required to hold cash in proportion to the amount of their deposits. This cash is termed bank reserves. (Currently, the reserves requirement is 10% of the total amount deposited in checking accounts.) Banks hold some of this cash in their vaults in order to meet requests for withdrawals, but typically much of it is held as deposits with the Fed. Some banks hold more reserves than they need to satisfy reserve requirements, but some find themselves with a deficit. Those banks needing reserves typically borrow them from banks with a surplus. 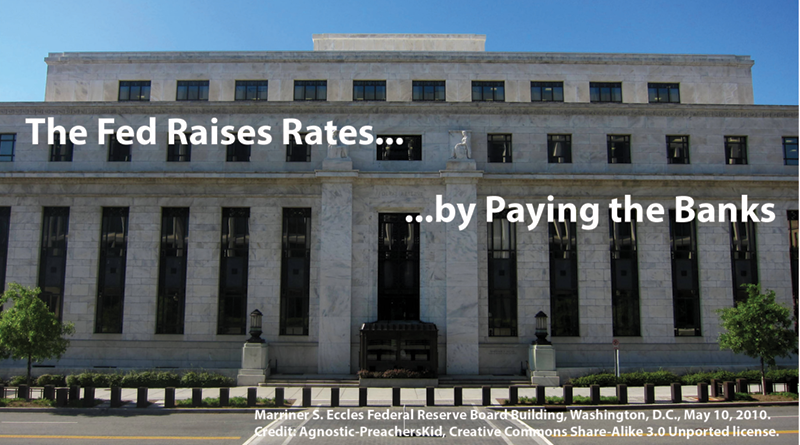 The interest rate that banks charge to lend their reserves to other banks is called the federal funds rate. When the Fed wants to lower the federal funds rate, as it did in 2007-08, it buys government securities and writes a check to the seller. When the seller deposits the check in a bank, the bank sends the check to the Fed, which then credits the bank with more reserves. A greater amount of reserves in the banking system reduces the need for borrowing to meet reserve requirements, and the federal funds rate falls. Likewise, when the Fed wants to increase the federal funds rate, it sells government securities. The buyer gives a check to the Fed written on the buyer’s bank, and the Fed reduces the amount of reserves the bank has on deposit with the Fed. The bank, now short of reserves, seeks to borrow them from other banks and is willing to pay an increased federal funds rate in order to do so. The reserves not needed to meet reserve requirements are called excess reserves. Up to 2008, the Fed did not pay any interest on excess reserves. To earn interest, banks lent out the cash to businesses and consumers and thereby encouraged greater spending. In this way, excess reserves were usually kept relatively low. After the failure of Lehman Brothers in September 2008, financial markets became unsettled and many of the traditional funding sources for financial institutions dried up. Into this void stepped the Federal Reserve, which dramatically increased its lending and other interventions to help the banks. In the process, it pumped money into the banking system and expanded bank reserves, significantly beyond the level of reserves necessary to maintain its target for the federal funds rate. In other words, without paying interest on reserves, banks would have so many excess reserves that did not earn any interest, and be so eager to gain at least some return on them, that the Fed would be unable to prevent them from lending at rates below the Fed’s target for the federal funds rate (2% at that time). By paying interest on reserves, the Fed would eliminate banks’ incentive to lend at rates below those it was receiving from the Fed. This, however, is a curious explanation. The Fed dropped its target federal funds rate by 0.5% on October 8, 2008, and then by another 0.5% on October 29. On December 16, it lowered its target all the way to zero (a band of 0 to 0.25%), where it has stayed for seven years. Why was it concerned about the federal funds rate falling below its target rate when it was in the process of dropping its target rate to zero? Moreover, in October 2008 the economy was moving into free fall. Real gross domestic product (GDP) fell at an annual rate of 8.2% in the fourth quarter of 2008 and unemployment was increasing rapidly. The Fed explained that it reduced the federal funds rate to zero “in order to provide stimulus to household and business spending and so support economic recovery.” So why was the Fed giving the banks an incentive to keep their excess reserves at the Fed rather than lend them out? The Fed’s action can perhaps be understood by examining how it interprets its objectives. In addition to its mandates affecting employment and inflation, the Fed is also responsible for promoting financial stability. For the Fed, this means easing panic in financial markets, but also protecting the viability and profitability of the banks, especially those judged to be systemically important. Promoting financial stability in the fall of 2008 meant the necessary step of intervening aggressively to prevent the collapse of the global financial system. But the Fed also interpreted it to mean bailing out large banks, even if the process did not sufficiently curtail the banks’ power and risky practices. And it meant paying interest on reserves. Such payments directly boosted bank profitability, even if they may have come at the expense of the broader economy. With the federal funds rate at zero, the Federal Reserve began its program of “quantitative easing.” This involved buying longer-term assets, U.S. Treasury securities as well as mortgage-backed securities. The Fed’s stated objective was to reduce long-term interest rates so as to stimulate spending in housing and business investment. There were three stages of quantitative easing, and interest rates did indeed fall. But, again, the Fed also had its eye on the banks. After the financial crisis, the demand for mortgage-backed securities fell, since massive numbers of mortgages were in default and payments on the securities were therefore down. As demand fell, the prices of the mortgage-backed securities plummeted. Many of the banks held large quantities of these securities. By purchasing so many of them, the Fed supported their prices and increased their value on the banks’ balance sheets. As a result of its quantitative easing programs, the Fed dramatically expanded its holding of assets. At the end of 2008, it owned less than half a trillion dollars in Treasury securities and no mortgage-backed securities. By November 2015, it held $2.5 trillion in Treasuries and $1.8 trillion in mortgage-backed securities. Because buying all these securities meant that the Fed’s checks became reserves for the banks, and because the banks were paid for keeping these reserves with the Fed, excess reserves ballooned to $2.5 trillion. The Fed’s announcement on December 16 that it is raising its target for the federal funds rate does bring to the fore Bernanke’s concern in 2008: how to increase the federal funds rate when there are so many excess reserves. The Fed ruled out any large-scale reduction of excess reserves when it also announced on December 16 that it would not be reducing its large holdings of securities. By not selling securities, the Fed would not be accepting checks from bank accounts and thus not reducing the reserves the banks hold on deposit with the Fed. The Fed’s solution, instead, is to double down and increase the payment of interest on bank reserves. It announced that it will begin paying interest on reserves at 0.5%. This procedure won’t reduce reserves, but will give banks an incentive not to make loans at interest rates below the amount they can get from the Fed. However, this will not totally solve the Fed’s problem. Even when it was paying the banks 0.25% interest on reserves, the effective federal funds rate (the rate at which reserves at the Fed were actually being traded) was below 0.25%. This is why the Fed adopted a range for the federal funds rate of 0-0.25%. The Home Loan Banks were able to lend federal funds at interest rates below 0.25% and still make a profit. In turn, banks were able to take the borrowed funds and deposit them with the Fed at 0.25%, making a profit as well. So when the Fed on December 16 established a range of 0.25-0.50% for the federal funds rate, it also announced a new procedure designed to keep the federal funds rate from falling below 0.25%. The new procedure is to conduct overnight reverse repurchase agreements (ON RRP) with the Home Loan Banks (as well as with banks, other GSEs, and money market mutual funds, which are important lenders in short-term markets). ON RRP is an imposing-sounding term, but reflects a relatively simple process: the Fed sells government securities to the financial institutions on one day and then buys them back the next. The financial institutions are essentially making an overnight loan to the Fed, with the securities as collateral. But here’s the point: the money the Fed pays to buy back the securities is not only a repayment of the original loan. It also includes an interest payment. And the Fed plans to pay interest at 0.25%, the bottom of its target for the fed funds rate, thus giving the Home Loan Banks an incentive not to lend at less than 0.25%. Although it plans to use ON RRP as a secondary tool to its main focus of paying interest on bank reserves, it anticipates that both of these tools will keep the fed funds rate within its target range of 0.25-0.5%. It seems that the Fed has backed itself into a corner, where the only way to raise the federal funds rate is to increase its payments to financial institutions. With reserves held at the Fed equal to $2.6 trillion, even a 0.5% payment to the banks would cost $13 billion. And, of course, including the expense of the ON RRP program and increasing the fed funds rate in the future would add even more to the cost. To add insult to injury, 25 minutes after the Fed’s announcement on December 16, Wells Fargo Bank reported that it is raising its prime rate (an interest rate tied to business and consumer loans) by 0.25% but not the rates it pays to depositors. Later in the day other large banks, including JP Morgan Chase and Bank of America, made similar declarations. Could the Fed, instead, choose not to pay interest to the banks and other financial institutions? This would have the effect of reducing excess reserves, but it would also mean that the Fed would have to delay raising interest rates. That would, in fact, be a good policy decision. Although the unemployment rate is 5.0%, inflation is still below the Fed’s 2% target. In the late 1990s, under then-Chair Alan Greenspan, the Fed allowed unemployment to fall below 4% without an appreciable increase in inflation. If the Fed waits, it could see how far excess reserves would fall without the payment of interest on reserves and how far the unemployment rate would fall without pushing inflation above 2%. But what if a growing economy and a falling rate of unemployment edged the inflation rate past 2%, say, to 3 or 4%? The top 1% of the income distribution would not like inflation to eat away at their accumulated wealth. However, during times of very low unemployment the demand for workers can be strong enough to push money wages up faster than prices, so workers without a job and those who haven’t seen a raise in many years would probably not be unhappy. Under current Chair Janet Yellen, the Federal Reserve has shown a genuine concern about unemployment, but it is still trapped in its assumptions: There is a “maximum feasible” level of employment. Above that level (or below the corresponding rate of unemployment) inflation will exceed its 2% target. The conclusion from these assumptions is that the Fed should raise interest rates to prevent employment from exceeding the “maximum feasible” level. Instead, the Fed should adopt a real full- employment target: a job for everyone who wants to work. It should adopt a “minimum feasible” target for inflation: the lowest possible rate compatible with full employment. We need a policy perspective in which economic justice for workers is a higher priority than paying the banks. MARTY WOLFSON is professor of economics emeritus at the University of Notre Dame. He was formerly an economist with the Federal Reserve Board. SOURCES: Ben S. Bernanke, The Courage to Act: A Memoir of Crisis and Its Aftermath, 2015; Federal Reserve Board, “Policy Normalization Principles and Plans,” September 17, 2014; Gara Afonso, Alex Entz, and Eric LeSueur, “Who’s Lending in the Fed Funds Market?” Federal Reserve Bank of New York, December 2, 2013; Federal Reserve Press Release, December 16, 2015.